As some of you already know, some of my most favorite smartphones over the past three years were made by HTC. Having used HTC Sensation, HTC Legend, HTC Desire HD, HTC Desire Z, HTC ChaCha, and HTC HD7 as my daily phones, I can totally vouch for the quality of handsets made by the Taiwanese electronics giant. If you've long been yearning to get a device made by HTC but the high price tag of their smartphones and tablets is what's keeping you from making a purchase, I have great news for you. 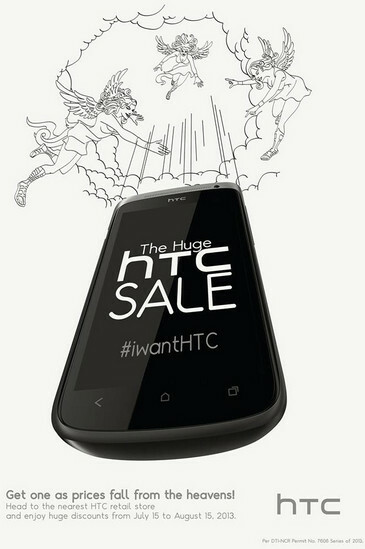 From July 15 to August 15, 2013, HTC Philippines will be mounting its first #iwantHTC Mega Sale across the archipelago where they will be giving consumers the chance to own an HTC phone at marked down prices on selected models. You can finally get as much as Php 1,000 off selected HTC handsets ranging from the One Family, Windows 8X by HTC, Desire Family and the long-standing models such as the HTC Chacha, Wildfire, Radar, Sensation family and the like. TP Friends, here's a complete list of all devices included in the sale. If you notice, the discounted prices of aluminum-clad HTC Desire HD, HTC Desire Z, and HTC Sensation are still high despite the fact that these handsets were released more than two years ago. I think this proves that HTC products don't lose their value all that fast. The #iwantHTC promo is available in HTC Concept stores at SM Mall of Asia, Glorietta 3, SM Megamall, SM North Edsa, Gaisano Mall in Davao, SM Cebu and all authorized HTC retail stores nationwide.